Also Jungs und Mädels, rote Kringel in den Kalener gesetzt und das Wochenende frei gehalten. Wir freuen uns schon sehr auf Whit und einen tollen Workshop! A traditional practice, Vinyasa Krama (movement and sequence methodology) is the most comprehensive representation of Sri T. Krishnamacharya's teachings of yogasana. Using breath as the harness between body and mind, these slow, deliberate, yet powerful vinyasas draw practitioners into an unshakeable state of one pointed focus, resulting in a deeply transformative experience. Sri T. Krishnamacharya is considered the father of modern yoga and it is through his tireless efforts to sustain and propagate the tradition of yoga, that yoga has become such an integral part of contemporary culture around the world. Many of his most recognized disciples include: B.K.S. Iyengar; Sri K. Pattabhi Jois; Indra Devi; A.G. Mohan, T.K.V. Desikachar and his longest standing disciple, Srivatsa Ramaswami. This workshop is applicable to all practitioners of yoga (including beginners) and will include in-depth discussion of Vinyasa Krama methodology and history, asana, pranayama and meditation practice, therapeutic applications and insight into the traditional teachings of Krishnamacharya. Whit Hornsberger is a teacher from Vancouver, Canada. He had the opportunity to study this traditional practice under the guidance of Srivatsa Ramaswami, Krishnamacharya's longest standing disciple (33 years). Stepping onto the mat initiates the process of deconditioning our habitual patterns of reactivity, awakening not only physical but emotional and mental flexibility. Our daily practice gradually removes the obstacles that obscure our interconnectedness, re-igniting our innate altruistic intelligence, transforming our lives. Yoga gifts us the ability to see ourselves in others and see others in us, breaking down the barriers of fear that inhibit our ability to live fully and love wholly. “Yoga literally saved my life when in my mid-twenties I found myself drowning in the darkness of my own mind after a knee injury ended my athletic career. The ancient wisdom traditions of yoga and Buddhism have healed all aspects of my human experience and I have dedicated my life to honouring the teachings by sharing them with anyone open to receive. 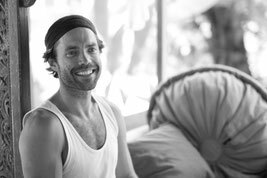 Off the mat my practice entails surfing the most beautiful spots on this planet, hosting retreats in inspiring locations around the world and connecting to nature as often as possible. Thank you for allowing me to be part of your path and for being a part of mine.